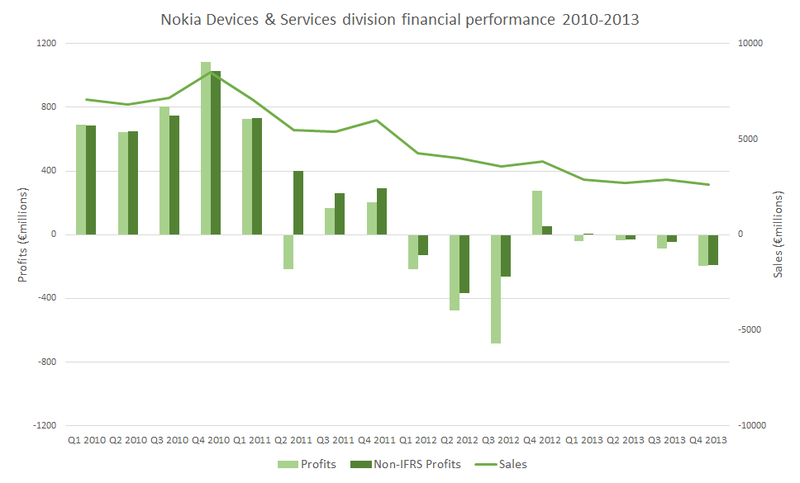 Nokia has released its Q4 2013 results, reporting an operating profit of €76 million (down from €439 million a year ago), with net sales of €6.109 billion (down 23% year-on-year). This is the last full set of results before the expected completion of sale of the Devices & Services division to Microsoft this quarter. Nokia has divided the results into continuing (NSN, HERE, Advanced Technologies) and discontinued operations (Devices & Services). The results for the continuing operations are an operating profit of €274 million (down 17% year on year) on sales of €3.476 billion (down 21% year on year). The results for the discontinued operations are an operating loss of €198 million (down from a profit of €97 million a year ago) on sales of €2.633 billion (down 29% year on year). The split between the two parts of Nokia is clear, with the continuing operations, dominated by the NSN business, being profitable, while the discontinued operations, which is being sold to Microsoft, continues to be loss making. Nokia did not disclose any exact unit volumes for devices, but did say that Mobile Phone volumes were up sequentially (i.e. more than 55.8 million), while Smart Devices volumes were down sequentially (i.e. less than 8.8 million). Looking at the disclosed sales figures and average selling price trends gives an estimate of Lumia volume of between 7.8 and 8.5 million (see below). This is well below analyst and industry expectations, and raises questions about Lumia sales trajectory ahead of Microsoft's acquisition of Nokia's Devices & Services business. Some of the poor performance may be attributable to uncertainty around the Microsoft acquisition, but the primary reason remains the competitive smartphone environment (e.g. price cutting by competitors, and the launch of new iPhone models and a number of lower cost Android devices). The immediate task for Microsoft will be to stabilise and then increase the sales of Lumia devices. Nokia has chosen not to disclose Smart Devices (Lumia) or Mobile Phone (feature phone) sales volumes or ASPs (average selling prices). However, Nokia did state that there was a year-on-year decline in sales of discontinued operations due "to lower Mobile Phones net sales and, to a lesser extent, lower Smart Devices net sales". On a sequential basis, Mobile Phone sales were flat and Smart Devices sales were down. In volume terms, Nokia says that there was a decline, year on year, "due to lower Mobile Phones unit volumes, partially offset by higher Smart Devices unit volumes". ASPs for both Smart Devices and Mobile Phones were also down year on year. Sequentially, Nokia notes that, "unit volumes increased in the fourth quarter 2013 due to higher Mobile Phones unit volumes, partially offset by lower Smart Devices unit volumes". ASPs were also down sequentially. A rough estimation of Lumia devices sales can be made from estimating sales of Smart Devices (€1.1 billion) and ASP (between €125 and €135). The ASP for Smart Devices last quarter was €143. On the assumption of €1.1 billion in sales, an ASP of €140 would give volumes of 7.8 million, an ASP of €135 would give a volume of 8.1 million units, an ASP of €130 would give a volume of 8.4 million units, and an ASP of €125 would give a volume of of 8.8 million units. 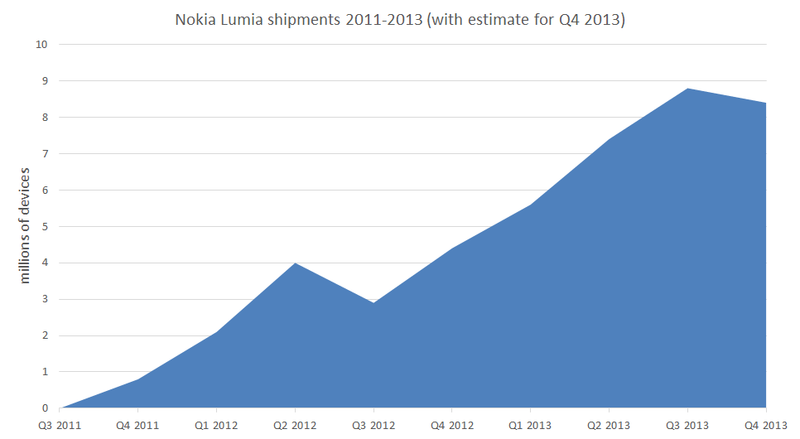 Update: WSJ reports that Nokia has confirmed a figure of 8.2 million Lumia units. That would suggest an ASP of €134, most likely reflecting price cuts to higher end devices. 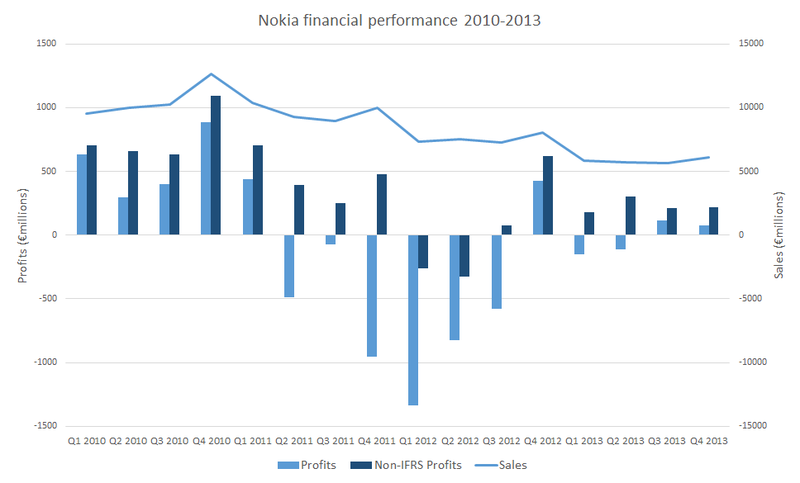 The fourth quarter of 2013 was a watershed moment in Nokia's history. Having received overwhelmingly strong support from our shareholders at our extraordinary general meeting in November for the sale of our phones business to Microsoft, we are diligently working towards defining Nokia’s future direction. I am pleased with the progress we have made thus far in our strategy evaluation and excited by the opportunities ahead for each of our three continuing businesses: NSN, HERE and Advanced Technologies. Going forward, Nokia's focus will be on the NSN, HERE, and Advanced Technologies business. NSN is a mature business, which after restructuring over the last two years, Nokia believes is "positioned to deliver solid business performance for the year ahead". Nokia regards HERE as having "long-term transformational growth opportunities" and will be increasing investment in the business in 2014. Advanced Technologies will focus on "continuing to invest in innovation" and is expected to increase its revenue from patent and IP licensing in the year ahead. The mobile devices business will transfer to Microsoft. Within the wider Microsoft group, financial performance will be assessed from the results of Microsoft's new hardware division. For other commentators, the main focus will be on device volumes, which, even if Microsoft chooses not to disclose them, will continue to be estimated by IDC, Canalys and other third party market research companies.